Happy Monday! I decided to start back up with Topbox again after hearing some really good things about them lately. Topbox is the number one Beauty Subscription Box in Canada for Deluxe to Full sized prestige products..
​Here is what I got in my November 2015 Topbox! 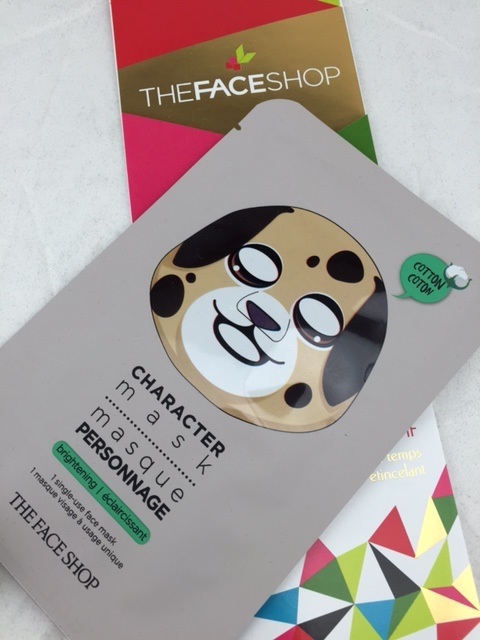 First Impressions: I got extremely excited to see The Face Shop in here and MUFE! YAY! This is adorable. I have been reading and hearing a lot about these masks. I personally find that wearing a blank white mask can be quite frightening. This is a fun twist to the standard mask and the scent was light and perfect. My face felt really hydrated after this mask! Okay this product is GOLD to me. I have a lot of redness on my skin and I have been using MUFE HD foundation and i'm so happy to now have this to help cover up pimples, redness and uneven skin tones. I love it. It was so light weight and removed the redness perfectly! I love trying new face scrubs so im really happy to see that they sent me one...actually two which is quite generous so that you can fully get the whole experience of the product! This smells SOOOOOOOO good!! And it comes in the best packaging ever. 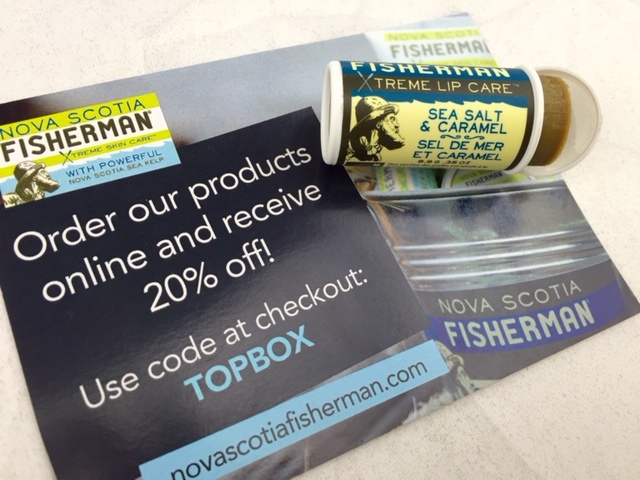 When you open the container you automatically smell the caramel scent and when you put it on the salt and caramel just blend wonderfully together. 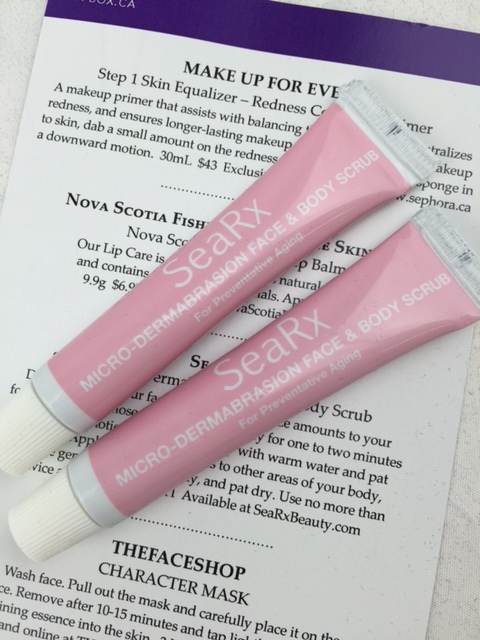 This brand is Canadian and uses all natural products. Im hooked! Overall: 5/5! I am really impressed with my November Topbox! 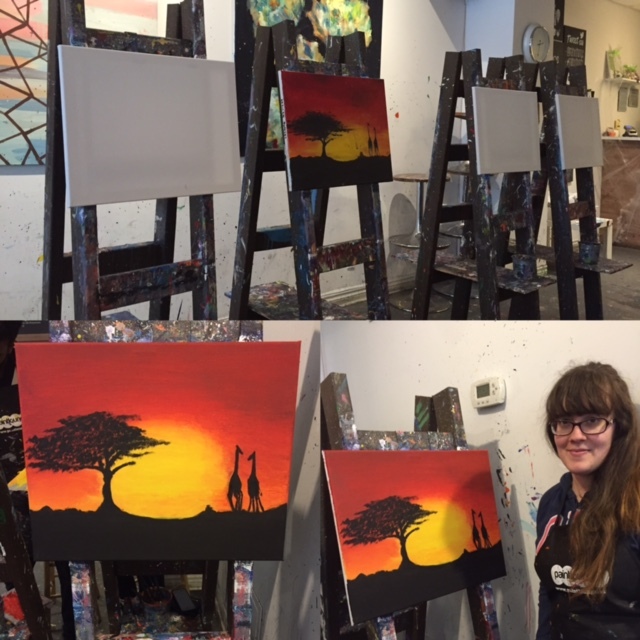 Last month my coworkers and I participated in a team building event at Paint Lounge in Toronto. 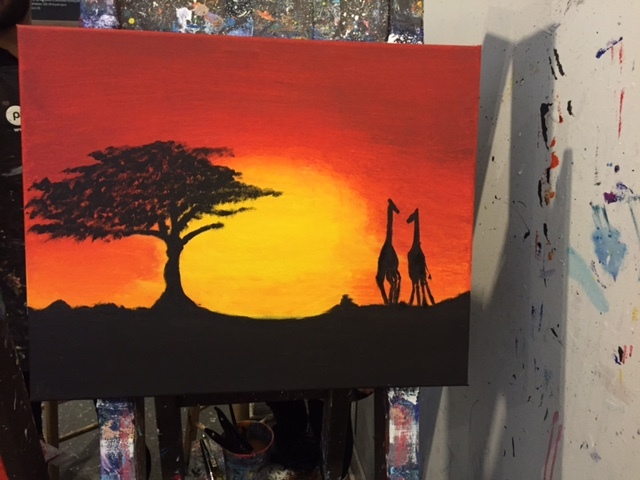 Paint Lounge is similar to Paint Nite, except it doesn't serve alcohol and it is located at their own paint studio. So we decided to try it out and see how it went! You can pick whatever painting you would like to do from their list online. Some are easy some are hard. Its totally up to you and how comfortable you are with painting when deciding which painting to select. Upon arrival to the location we quickly noticed how quite and reserved it was. They also have a cafe at the back. Our teacher didn't really greet us which to me was a bit of a downer. After waiting for a few more people to arrive the "class" started. Our teacher took the painting and showed us VERY VERY basic skills on what to do and what brushes to use. And then she told us to go paint. If you have never painted and are looking for a workshop this is NOT the place to go to. I found this place to be more independent work than anything. The painting was on display and you would literally have to just look at the finished result and try to replicate it. They provide all the materials, paints, brushes, aprons, canvas. I personally do not mind being left alone to do my own thing , it was relaxing and a perfect way to relax. Once you are done you blow dry your painting and take it home. Overall: It was really fun going with the team and working on the same type of painting together and seeing what we all came up with! Im pretty impressed with how mine came out. I have never painted before! Would I go back: Yup!! One thing I would change? : I find it very unprofessional to have the staff go out back while students are there just so that they can gossip and have a smoke. Staff definitely need to be more attentive. Overall rating of the location: 3/5 . I would have given it 5/5 if the staff were more professional and showed that they cared a little more. 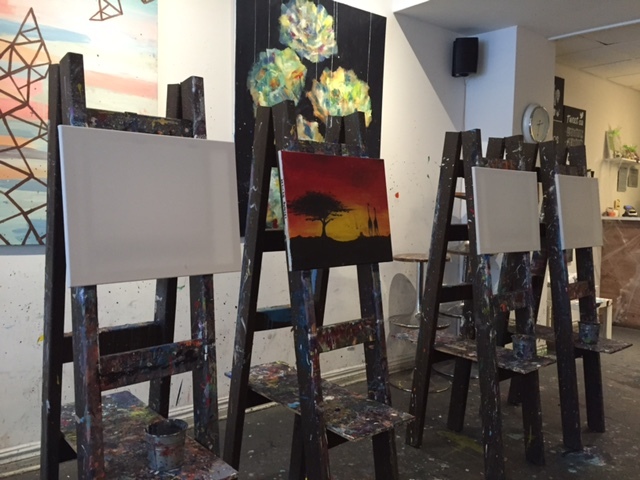 Have you been to Paint Lounge? Let me know your experience! Here is another one of those vintage toy reviews. 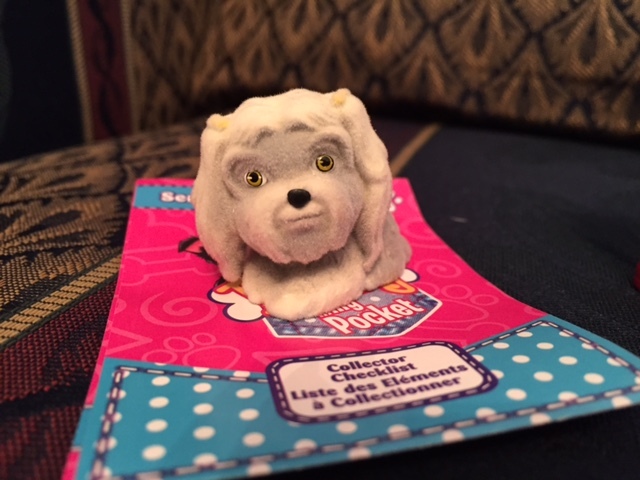 When I was small my dad and I would walk up to the nearest 7-Eleven on Sundays and we would pick up these adorable Puppy in my Pocket Blind Bags. I think I had all of them in the series. They were great with realistic detail and totally looked like the breeds of dogs that you could relate too. I was so excited to see this in my local Toys R Us here in Toronto. I had seen reviews about them as well on youtube so I had been searching for them. What is it:? Puppy surprise is a mystery bag with 1 mystery puppy. There are quite a few to collect! Where can you find them: Walmart, Toys R Us. The bag itself is adorable. This is series 1 and it looks really cute and different from the original series. When I opened them I found them to be very very different than what I was expecting. These figures are flocked (fuzzy) and to me they do not look realistic at all. They have more of an imaginary feel to them. This is supposed to be a Maltese. I am a little disappointed with this series mostly because I thought it would be truer to the older series. The puppy doesn't look like a dog to me at all (Maybe its just this one) and the details are a little lacking. I do think that a younger audience might like these better! Its still adorable and cute to collect. What do you guys think? Do you like the new Puppy In My Pocket? 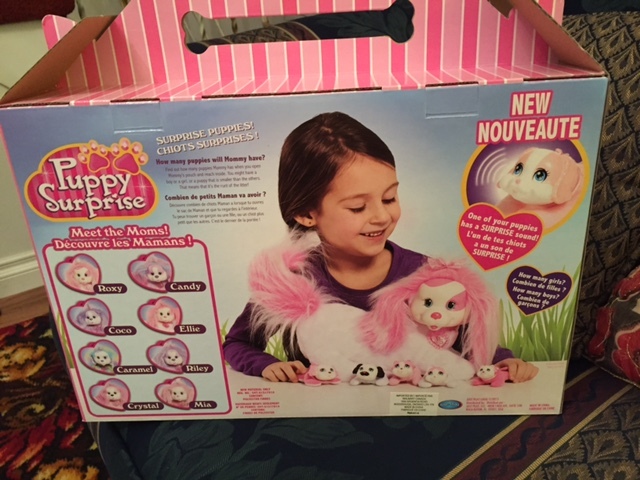 So I caved in and got one of these toys that I loved as a child....Puppy Surprise. If you don't know what they are, they are plush Dogs that have little plush puppies inside of them. You don't know how many you are getting until you open the Velcro up and see how many puppies you got. These were SUPER popular in the 90's and they also had, Pony Surprise, Kitty Surprise and at one poiny Bunny Surprise. It looks like Just Play has started remaking them. I love that they did because as a child my Puppy Surprise was so overly played and then one day I lost it while traveling. I was so bummed but then they weren't around anymore. So when I heard from a friend that they were back, I checked my Walmart (Online) I snatched one up. However, let me tell you this...Puppy Surprise is extremely hard to find. They are constantly sold out online on Walmart.ca or Toysrus.ca. But if you are in the USA don't worry you will have no issue finding them at all. How many puppies can you get: 3, 4 or 5! Roxy is a gorgeous white and pink pup with the softest fur. She is perfect for any child! 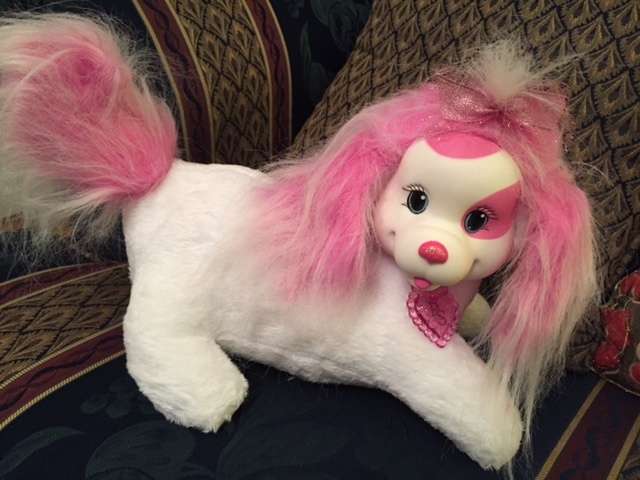 The pink fluff on her ears and tail are lightly twined with some tinsel and she has the cutest sparkly nose. I literally squealed when opening this up. I remember as a child how difficult it is for you to get a boy puppy, and i got one! I got three little pups in this package and they are just adorable. The pink bodied puppy is the one that makes two barking sounds. Their bodies are plush compared to the beanies they used to use. Overall: I would recommend this to anyone young or old. 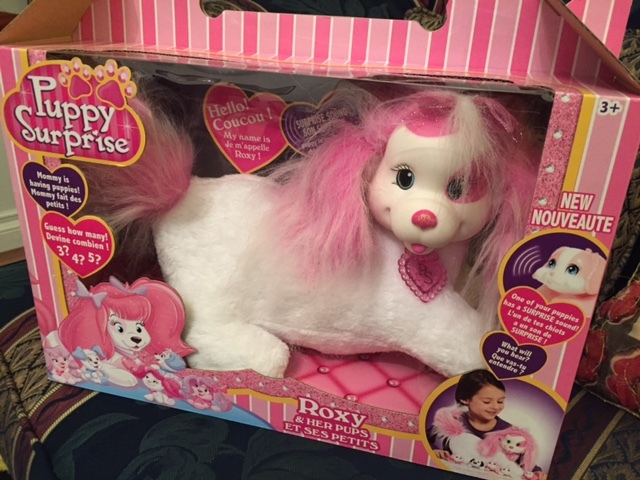 This is a classic toy that is just too adorable! 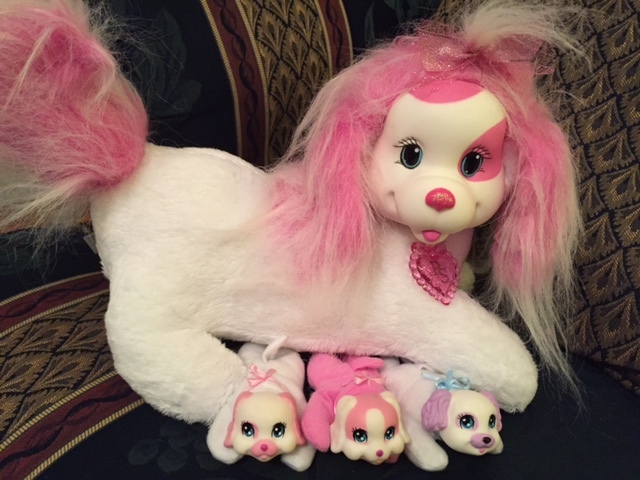 Did you guys have a Puppy Surprise growing up? 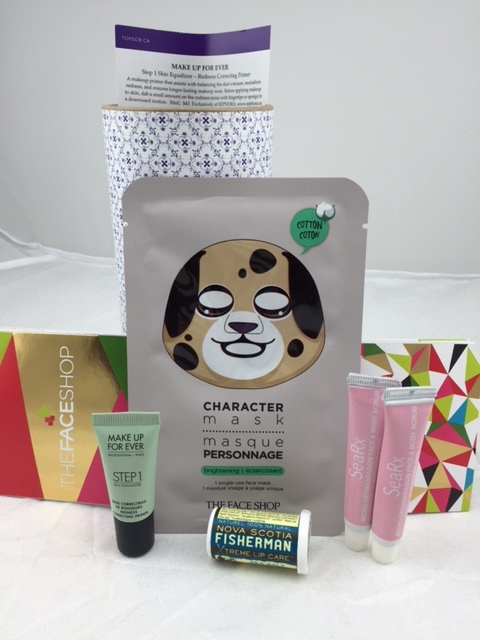 Time for a subscription box review! This one is very new and I have been subscribing to it for the past two months and I have to tell you, I absolutely LOVE this box and I know you will too! 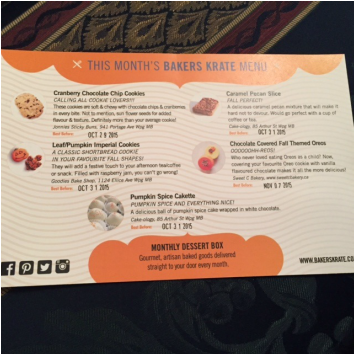 "Bakers Krate is a subscription box company that features hand crafted baked goods produced by Canadian dessert experts. " Ummm yesssssssssssss!!! About time Canada has its official Dessert box! When I saw this on Girl Meets Box, I literally just signed up without any hesitation! Lets dig right in shall we? I absolutely love the assortment of goodies this month. It all reflects Fall and all of Falls delicious delights! The box comes with an awesome product card that also has best before dates! Yay! The box also comes with the official Bakers Krate fork! Genius! I love imperial cookies! These are perfect. They have a great amount of sweetness and are filled with the most luscious jam. Ummmm this was so delicious that my family and I ate this right when I opened the box. Its totally gone.....it was THAT good. Lets just say its good thing that Cake-ology is in MB and im here because I would be at this bakery every weekend stuffing my face with amazing desserts! This little cakette was rich, moist and sang the heavenily Pumpkin Spice Song. Mmm! These will definitely be interesting. I have always loved Oreos so it will be interesting to see how these taste! We got two of them so it was definitely generous! I love anything with Cranberry however I really dislike when its too sweet. These are a good balance between the tartness of the cranberry and the sweetness of the cookie. Overall: I absolutely LOVE my Bakers Krate Box and is my favourite one. Want to try it out? Click here. 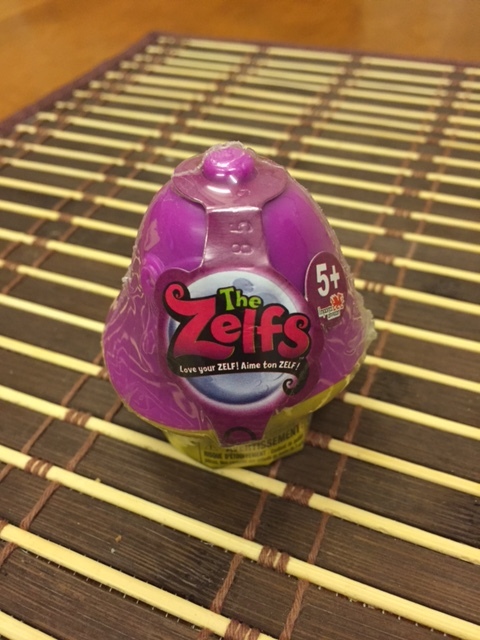 Lil' Zelfs Mini Mushroom Pod. Today's review is going to be the start of many reviews to come which will be non-subscription box orientated. I will begin to review beauty products, recipes, collectibles and much more. Hopefully this will help many of you when selecting items at the stores. Personally I know that reading reviews greatly help me when deciding what to buy. I was given this product to review. These super quirky lil' Zelfs can be displayed in the new mushroom pod container or used as a pencil topper to show off their crazy colourful hair! This company is owned by Moose Enterprise (Australia). These are essentially little mystery "eggs" or blind bag sort of things. 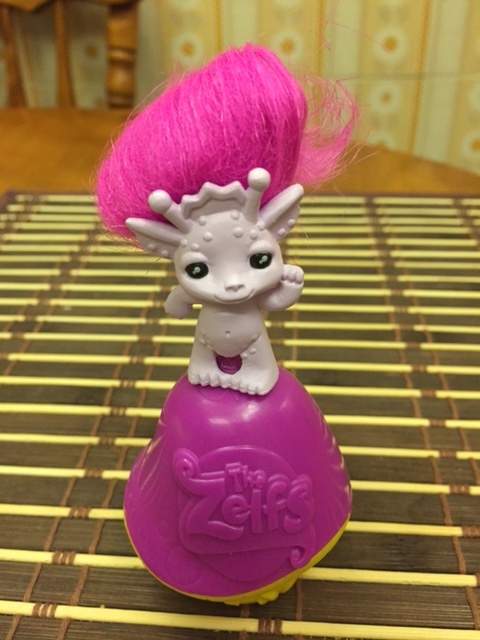 When I saw these, I automatically remembered the trolls that we used to collect as children but these are definitely way cuter! These Mystery Pods are great for kids. I would consider putting them in Christmas stockings or even using them for an Easter Egg Hunt! Inside each pod you get one mystery figure. The figures can come in matte, gloss, or sparkly. The sparkly ones are rare. There's a ton of them to collect so this would be great for your child's collection! You can display them on the top of the mushroom (there's a little nib where the Zelfs can stand), put them on your pen or pencil or just display them as is. You can also keep track of your collection with the informational deck that comes inside them! Rating: 4.5/5 These guys are super detailed and come in an amazing packaging where you can also display them. Perfect for gifting and collecting! Been a while since i have updated this thing. To be hones, it has been one of the most busy time of my life! Work was wayyyyyyy too busy! I finally got another Influenster VoxBox! Yay!!! 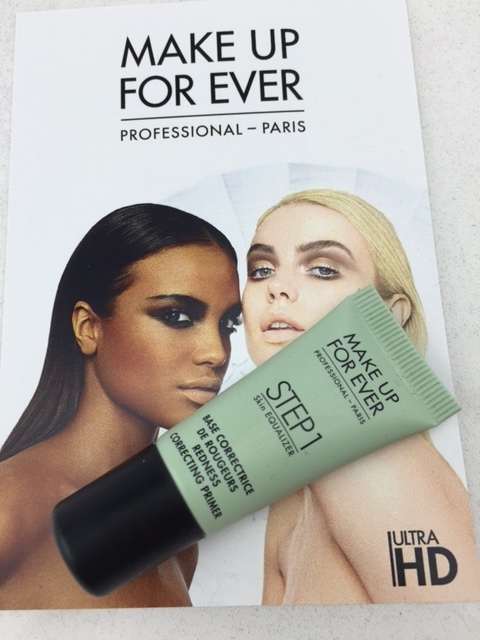 Just so you all know I received these products complimentary for testing purposes via Influenster. The thoughts expressed in this blog post are my own and I was not paid to write any of this. About two weeks ago I got my box. The week before that I had received a survey asking me about my skin type and tone. So when I opened up my box I was happy to see that I got the product that i most needed right now! My skin is super dry and I have always been curious to see what a Water Sleeping Mask would do for my skin. Super happy to get this one! The days to follow, Canada started to get cooler climates and of course that means more dry skin for me. Bleh! I quickly decided to try it. 4. I forgot i was wearing it! I put on a nice even layer on my skin before bed. The next day I washed it off and my skin felt clean and looked so refreshing! I have not had any dry patches on my skin since then. I am pretty impressed. Right now I am using this weekly. Would I buy this? Absolutely! If you have dry, dull, patchy skin, this is something you need to try out! April has come and is almost gone and I have to admit that it was a really good month! I received my Munch Better Box really quickly. I actually won this box because of their #munchbetterfaves contest they do each month. So thank you very much!!! "You’ll get 5-8 carefully chosen snacks a month sourced from a variety of healthy food companies, and often a couple of samples. You’ll also get a special item to help kick-start a healthy habit (for more on that, see our question below about the “Why Don’t You?” product). 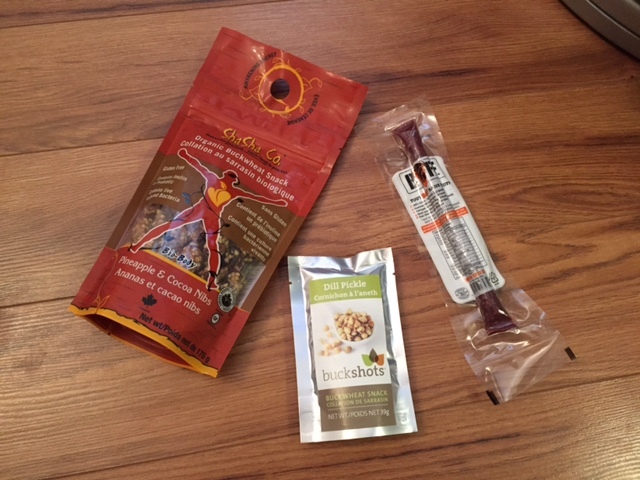 Some examples of snacks we include: raw energy bars, organic fruit and nut mixes, vegan cookies, artisanal crackers, dark chocolate…and much more." Just in brief glance I am already in love with the contents of this box! Madegood bars are one of my favourite healthy bars. They are sweet and really hit the right spot when you are feeling hungry. They aren't dense like most bars out there so that was a huge hit for me! I really had never heard about this company but i was soon excited to learn that they are a Canadian Brand! These balls are rich and sweet. You can tell that they are not made with refine sugars or artificial flavours. They really give you a power boost between long days. I had these between meetings and it held me over until lunch time! Okay, you are all going to laugh at me. But I added these to a bowl of white rice and it made the rice absolutely delicious! I'm one of those people who cannot have white rice on its own. Its just not my thing. These were a great to the dish and gave out that authentic indian flavour! To be honest, I haven't tried this drink because I absolutely dislike Kombucha in every way. This was a pass for me! I have never tried this before but I was eager to try this as I get really tired of eating Peanut Butter sandwiches all the time. To my surprise this actually was so delicious and made me forget that I was even eating something other than peanut butter. Its silky, smooth and rich in flavour. I love it! I would definitely have this on crackers as a snack as it is really high in calories. But WOW, DELISH! Overall: Not my favourite month but still good! I wold give it a 3/5 :) Why? the tea wasn't a hit for me and the box seems really low in value. I will see what May brings! Do you want to sign up with Munch Better? It's open to Canadians Only for $25 a month. Sign up with Munch Better Here! So I seriously missed having this box in my life. I had to stop it last year because I just wasn't getting much use out of it. But now with some new dietary restrictions and the fact that i'm trying to snack healthier, I thought it would be a good time to go back to this box. Plus, I love supporting Canadian Boxes! What did I get? Lets check it out! I think out of the box, this is probably my least favourite product as I find buckwheat to be very hard to eat for me. I love the taste tho, its delicious however the little nibs just are not too easy to eat. My mom took these right away! She absolutely loved them. They are fragrant with Dill and she absolutely loved these as a snack. Delicious!! I loved this!!! Made with free range bison. Okay okay so I absolutely love these! We got them in our box last summer and It was a total hit with me especially if you know how much I adore brownies. This was a great gluten free option. Dense, sweet and delicious! These were amazing. Perfect with a bit of dip for a snack. These were light and not as pungent as other seaweed snacks. Amazing! This was a really interesting packet to receive. You put it in a cup of water and it has about 1000mg of vitamin c. It really doesn't taste great but I guess if you feel like your catching cold you wouldn't mind the taste! Wow, these are coffee crisps! Delicious!! I really enjoyed eating them in the morning. They are gluten free and made with Banana. Really nice texture and kept me from getting the munchies! 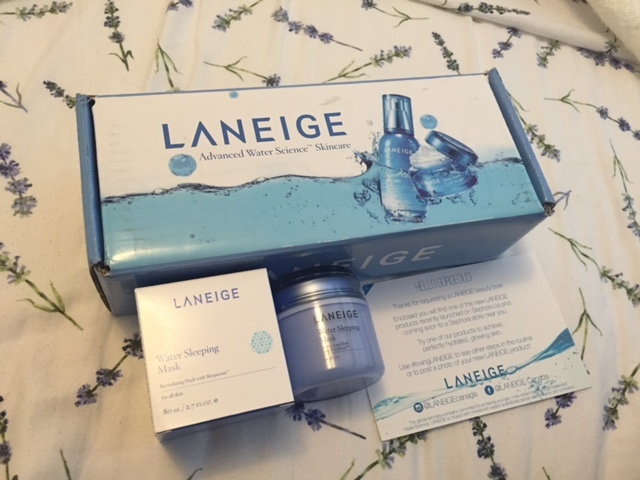 I really enjoyed my box this month and have tried everything that came in it! Wow, did anyone else feel like the month of March is just zooming by? Maybe its just me, but at least the weather is changing quite nicely. I was super surprised to receive my Bowzer Box this month, but thats because I didn't realize that it was already the 15th of March! 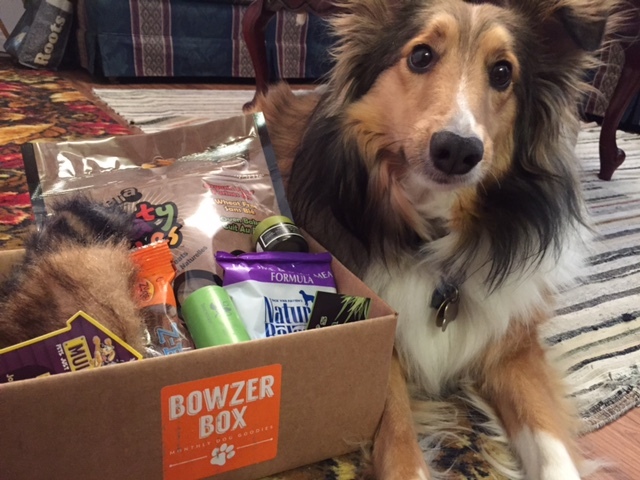 Bowzer Box is a subscription service that delivers a box of doggy goodies every month. You sign up for a 1-, 3-, or 6-month subscription and will receive 5-6 items such as dog treats, toys, and accessories right at your door. 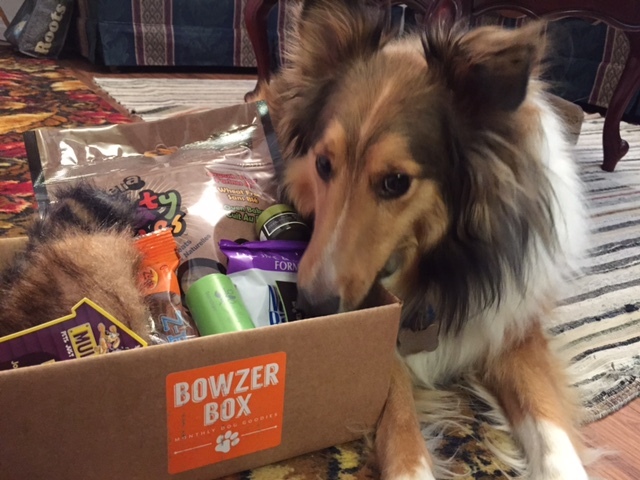 Bowzer Box includes a variety of handpicked items including full size toys and treats (wheat free), samples, and coupons from various brands that we, and our pooches, love. We look for only the best quality, tried and true products, and we aim to take the guesswork out of providing for your pup. Every box is unique and each one will highlight a Canadian product. As you can already tell, Bailey was super anxious to get into this box. Every picture I took consisted of him digging his nose into the box to get to the Amelia's cookies. 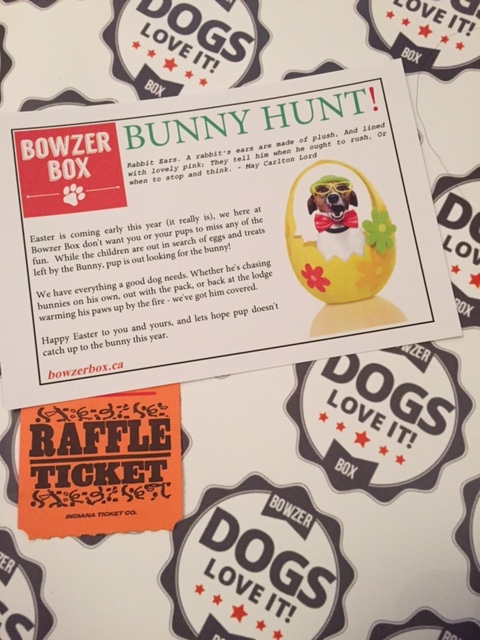 This months box was Bunny Hunt themed! It came with a fun raffle ticket and some extra poop bags! 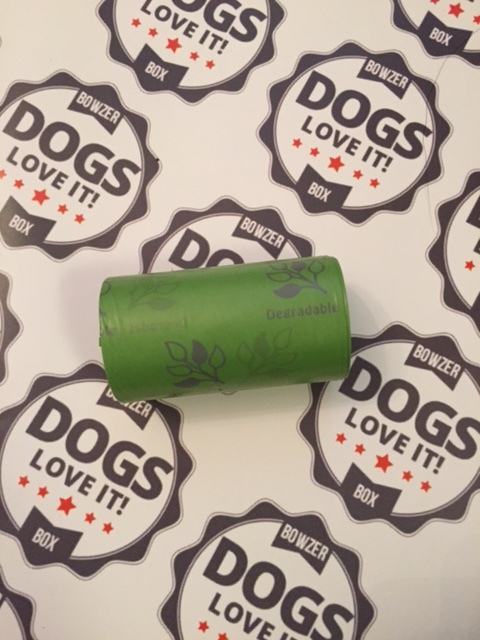 Who doesn't need poop bags? Words cannot describe how happy I was to see this HUGE bag of treats in the box. 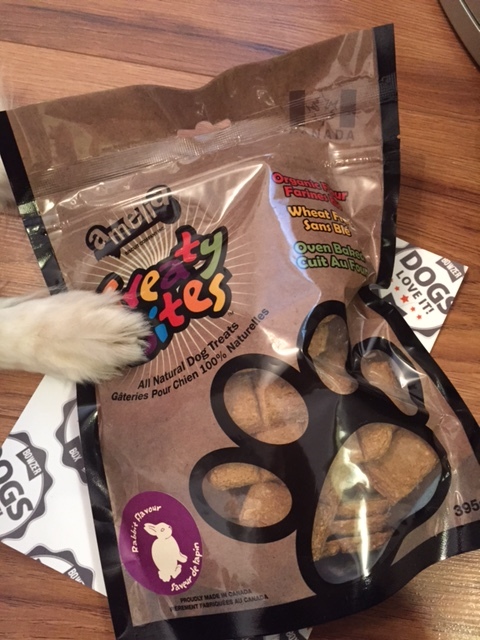 We are big big fans of Amelia and absolutely love all of their treats. This is one brand I would not mind seeing each month in the box. As you can see Bailey couldnt even wait for me to take a picture. He was always pawing at the bag. 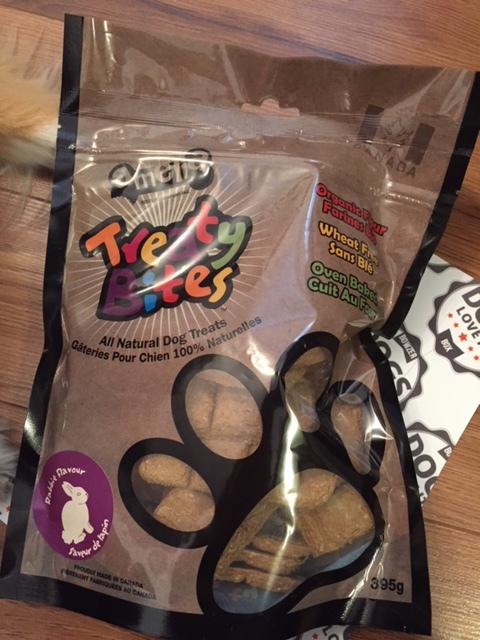 These treats are huge and really crunchy. Bailey begs, cries and whines for more. They are a Canadian brand and I love them! Zukes is great! We have tried these bones in different flavours many times before and we really like that they are natrual and grain free. 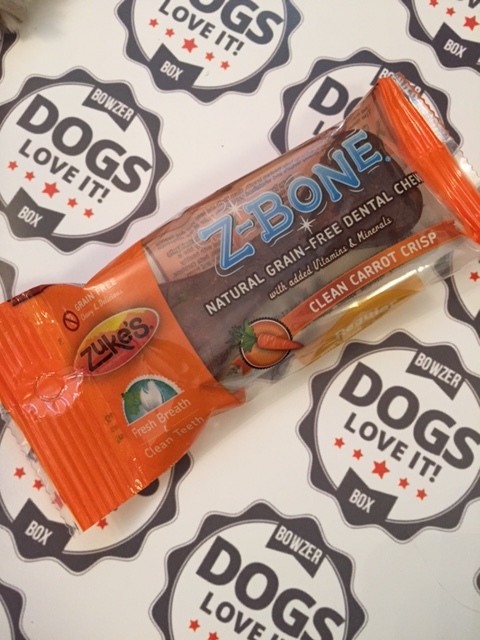 We do not support a lot of dental chews because of what they put in them, but this is great! When I first saw this I had to reread what it said. 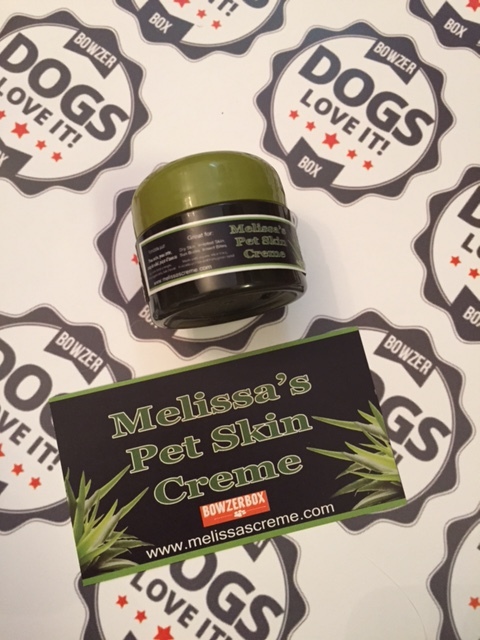 Then I got super excited to try this product out as my dog has super dry cracked paws from the snow and salt this past winter season. 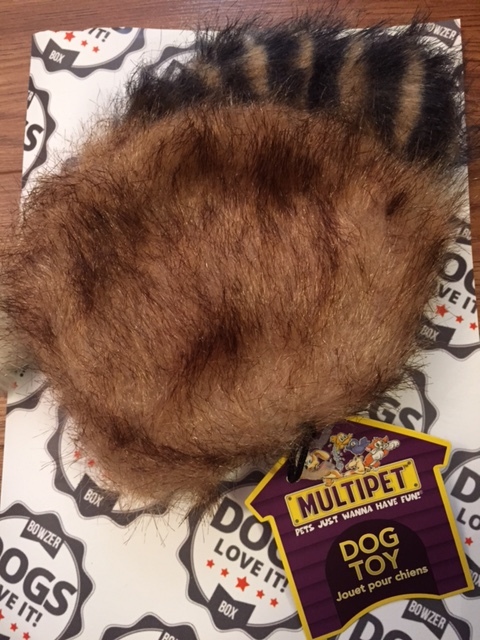 I tried it on him and instantly saw that it absorbed super well and my dogs paws were left soft and crack free. We love this! This is a great new product and I hope we see more things like this! 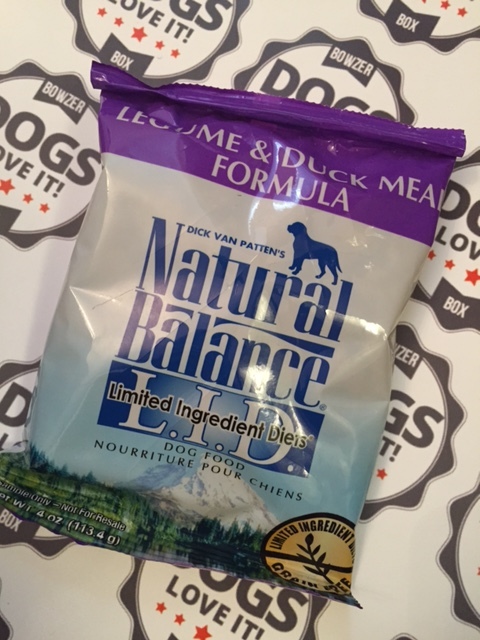 We are always happy to receive samples of dog food! We know this brand pretty well so we will be using these in his brain ball that he loves to toss around! OH MY WORD. Okay, we thought this toy was the best one yet. this is a mini Daniel Boone Hat. It has a crinkle to the top of the hat an a squeaker on the bottom! So cute! Bailey loves it. We lovvvvvvvvve this box. Perfect spring box!!! $4.50/month flat rate shipping charge applies. Use my coupon code: TOSB for 10% off your initial sign up!